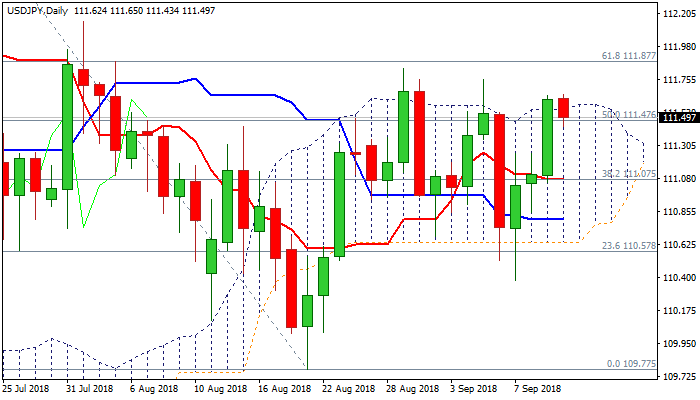 The pair is again facing strong headwinds at daily cloud top (111.58), despite Tuesday's strong rally broke and closed above the cloud, as Wednesday's action is so far in red and returned into cloud. Choppy directionless mode within thick daily cloud extends into third straight week, with several unsuccessful attempts at both cloud boundaries. Weakening 14-d momentum which created bear-cross and heads towards negative territory, slows bulls and offsets bullish setup of daily MA's. Dip-buying scenario is expected to remain favored while converged 10/55SMA's (111.20) hold, with bullish scenario requiring repeated close above cloud top to open way for test of next pivotal barrier at 111.87 (Fibo 61.8% of 113.17/109.77 descend). Otherwise, close below cloud top would signal another false break higher, while return below 10/55SMA's would weaken near-term structure and neutralize existing bullish bias.